With the FI9821PR, you'll enjoy rich HD securely broadcast with dual-stream and H.264 compression to optimize bandwidth usage on your network. Intelligent motion alerts provide accurate realtime monitoring. Clear digital zoom provides a closeup on small details. Powerful IR-LEDs provide night vision up to 26ft. Wide 75° angle keeps the action in-frame. Camera includes free app (iOS/Android) and supports IEEE 802.11n 2G band WiFi and dual system backup. Versus any IP camera, WiFI wireless security camera system, or CCTV home security camera system, the FI9821PR is a classic cornerstone of professional quality + value in the home monitoring and CCTV industries, now upgraded with 2017 firmware and an extra long power cable for more convenient placement (note: this is an indoor camera, but we have outdoor security camera models such as the FI9800PR). With unsurpassed performance value - including a full USA Warranty - you can enjoy peace of mind about your purchase as well as the things you love. HD resolution 1280*720p at 30FPS with a real-time 720p video stream. Check the spec of FPS before purchasing a real-time HD camera. Motion detection and intelligent alerts can send real-time push notifications to your phone with captured images. Strong WiFi signal by a 2.4G 3dBi antenna enabling longer distance than 5G with option use higher gain antenna 5db.High quality 2-way talk, and hassle free for RMA by a Full USA Warranty and support service by support@foscam.com and 1-844-344-1113. Optional cloud storage (30-Day Free Trail) and Low-cost cloud plans secured by US-based AWS server. CLOUD is of high-level security and privacy protection versus others. 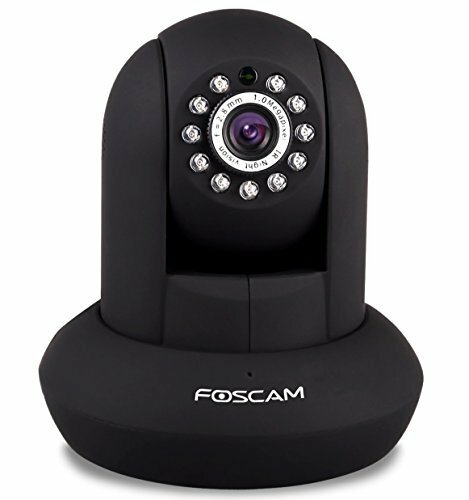 Foscam never require permissions of phones which is risky to the privacy. Remarkable field of view (FOV) with a wide-angle high quality optical 1.0 MP lens (f=2.8mm) with 75° view angle, 300° horizontal Pan and 120° vertical Tilt rotation creating a perfect coverage. Night vision range up to 26 feet by 13pcs IR LEDs.